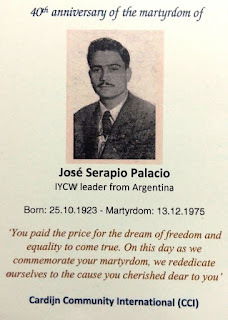 Argentinian ex-JOC leader and IYCW lay collaborator, Jose Serapio (Pepe) Palacio, was remembered at a memorial Mass at the Archdiocesan Pastoral Centre in Chennai, India, on Sunday 13 December, forty years to the day after he was killed by military or para-military forces. Two days earlier on 11 December 1975, Palacio had been abducted after leaving his trade union office in Buenos Aires, becoming one of thousands of “desaparecidos”, i.e. people who “disappeared” in the Southern Cone countries of Latin America under the military and military-dominated governments of that period. On 13 December 1975, a large group of up to 80 armed men descended on the family home, taking almost all of his personal documentation and photos recording his life work as a JOC leader, trade unionist, and activist in the MOAC (Christian Worker movement). His wife, Amalia Castaño de Palacio, who had also been a JOCF leader and fulltimer, and their three sons were left in the dark for decades concerning the fate of their husband and father, recalls Jose Luis Palacio, eldest son of Pepe Palacio, who was then fourteen years old. Earlier in 1975, the IYCW had appointed Pepe Palacio as its first lay collaborator. “Unfortunately, he did not have the opportunity to take up that responsibility because of the military repression in Argentina at that time. “We had very little information then. However, in a very informal manner, we heard that he had been assassinated by Argentine military,” Del Rio noted in a message for the 40th anniversary. Days after Palacio’s disappearance, the IYCW launched an international solidarity campaign seeking his release. However, it was not until a later Argentinian government finally opened up access to its archives that it was confirmed that Pepe Palacio had been tortured and shot two days after his initial disappearance. 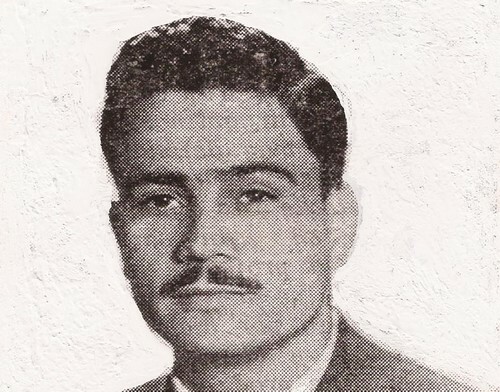 Although the exact reasons for his abduction and killing remain known, it appears likely that Pepe Palacio, who also had strong links with Chilean JOC and union leaders, may have been killed under the CIA-assisted Operation Condor program to assassinate union and popular leaders suspected of links to the left, Jose Luis Palacio believes. Jose Luis, his wife Stella Maris, and their daughter Belen, took part in the Memorial Mass celebrated by current Chennai Archdiocese youth chaplain, Fr Varghese Rozario. Ironically, it was also the 29th wedding anniversary for Jose Luis and Stella Maris, who had been married in 1986, before the details of the death of Pepe Palacio were known. “Please trust me that the life of your father will always written and stay in our heart, in the heart of young workers, women and men and in the heart of YCW that will encourage us to do more and take action to achieve what he also want to have, it is Just Work and Dignified Life for all young workers,” he added. 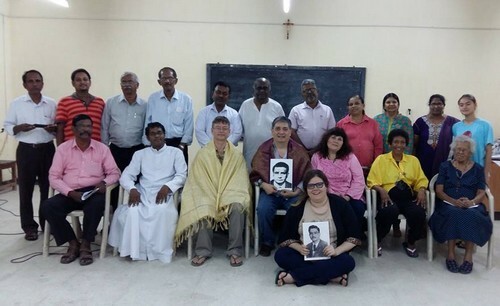 Former YCW India and CCI chaplain, Fr Soosai Servatius, also celebrated another memorial Mass in Nagercoil, in India’s Kanyakumari district on 11 December.